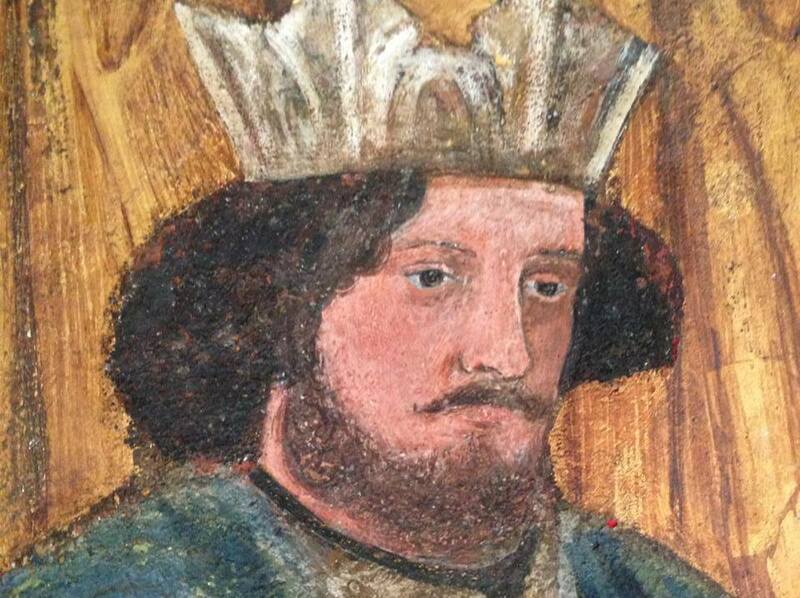 A mural painted by Pre-Raphaelite luminaries has been found hidden behind patches of 1960s wallpaper and a wardrobe in the master bedroom of Red House, the custom home built in 1859 for William Morris, founder of the Arts and Crafts movement, and his new wife Jane Burden. They only lived in the house for five years, selling it in 1865. It passed through various hands until 2003 when it was acquired by the National Trust. 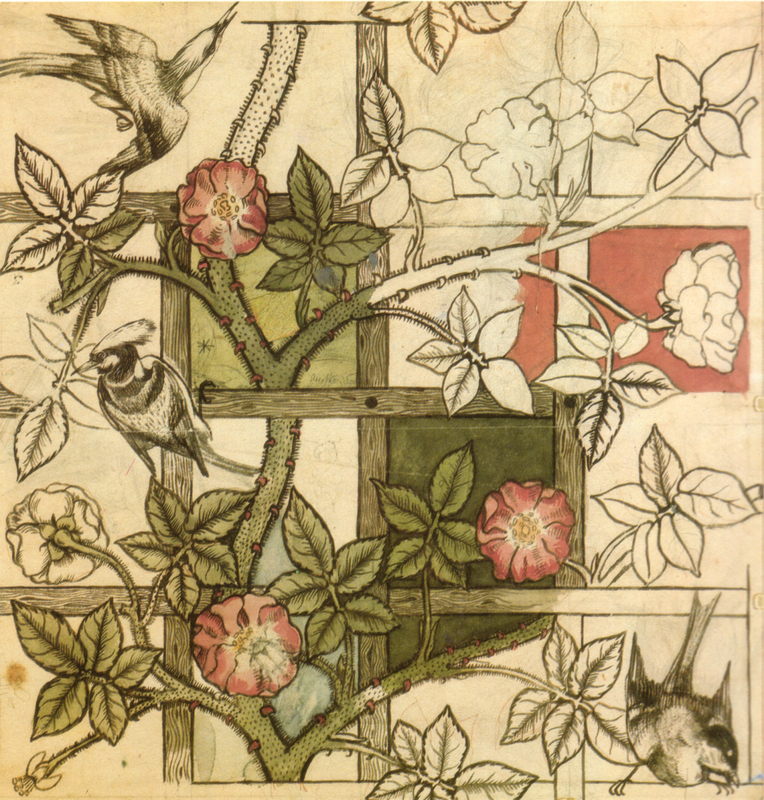 The interior had been subjected to some unfortunate renovation choices over the decades, among them the application of imitation William Morris wallpaper over the mural in the Morrises’ bedroom. One faded female figure and parts of an indistinct fifth figure were visible behind the wardrobe but in very bad condition. 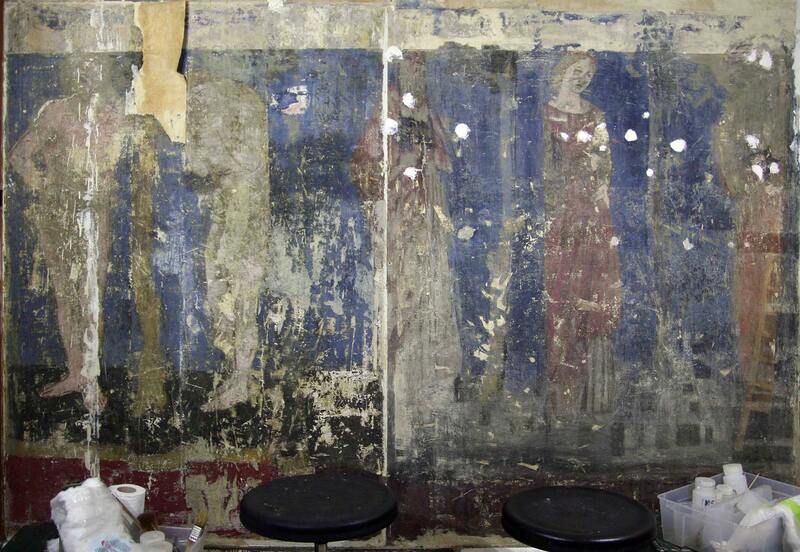 The National Trust raised £100,000 ($156,530) from the Wolfson Foundation and its own budget to restore the original mural. 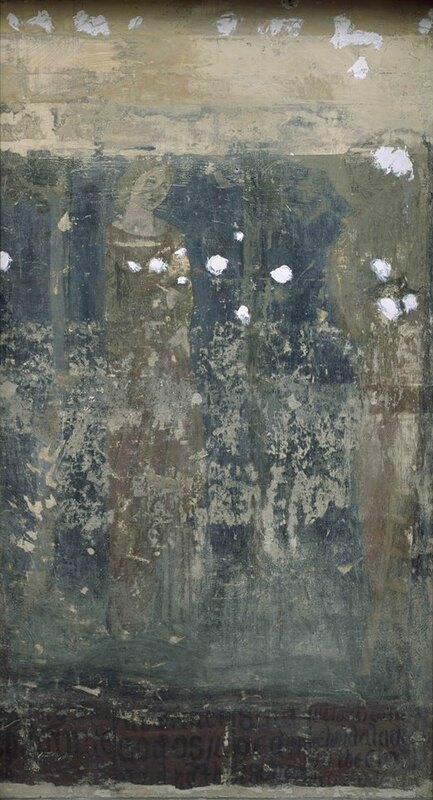 When the wardrobe and wallpaper were gingerly removed, conservators discovered a six foot by eight foot painting with five figures, not two, designed with trompe-l’oeil folds to look like a hanging tapestry. The figures are characters from the Bible. On the left are Adam and Eve with a snake climbing up the tree between them whispering disobedient things in Eve’s ear. Noah stands in the middle of the composition holding a small model of his ark. Rachel and Jacob perched on his ladder are on the right. Those are the two figures that were barely visible when the project began. Beneath Noah, Rachel and Jacob is a string of faded black text on a deep red background. 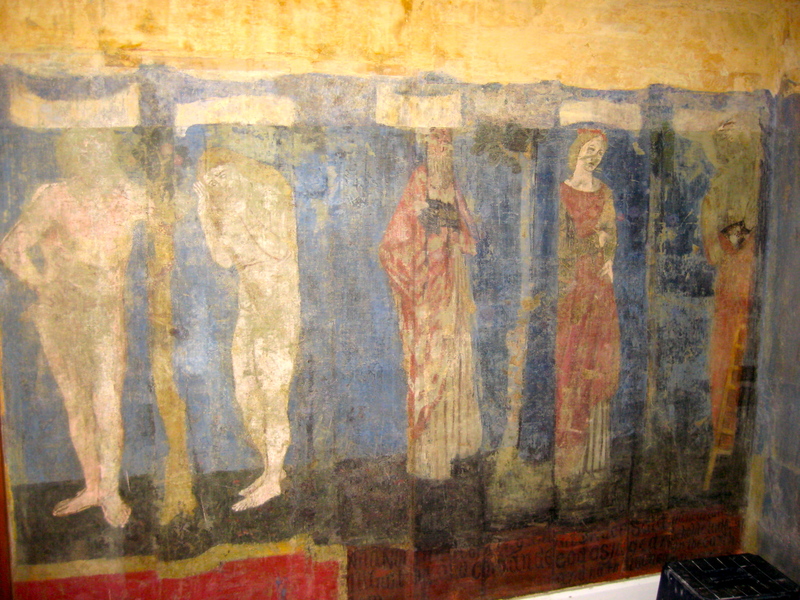 The mural had been ill-used by previous renovations. Old wallpaper was scraped off to make room for new wallpaper, and in the process paint was scraped off too. 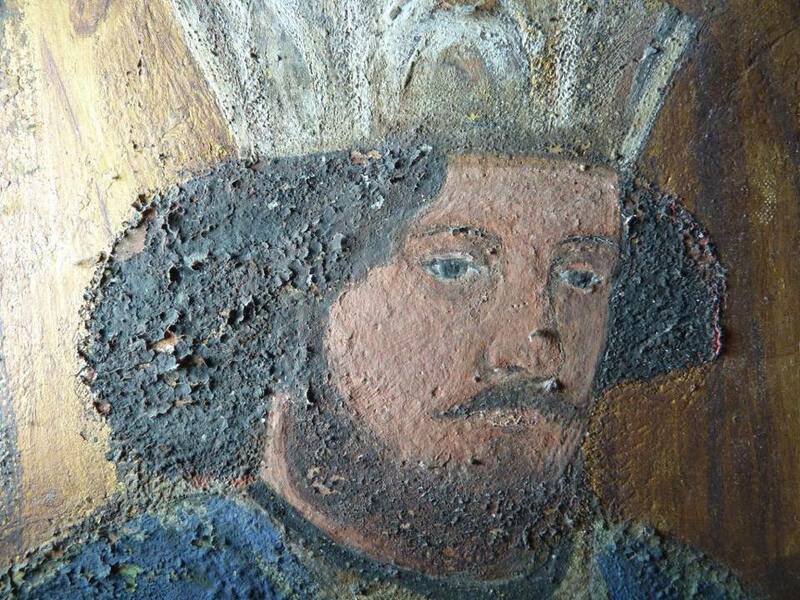 The remaining paint was flaking and pockmarked with divots. After two months of conservation, the mural was stabilized and , while the colors are still faded and there has been irrevocable paint loss, the five figures are distinct now and the text has been identified, thanks to the Red House’s Twitter and Facebook followers, as Genesis 30:6, which reads: “And Rachel said, God hath judged me, and hath also heard my voice, and hath given me a son.” The cleaner figures now show evidence of individual styles of the artists who painted them, and the National Trust hopes to pinpoint which of the Pre-Raphaelite Brotherhood painted which character. 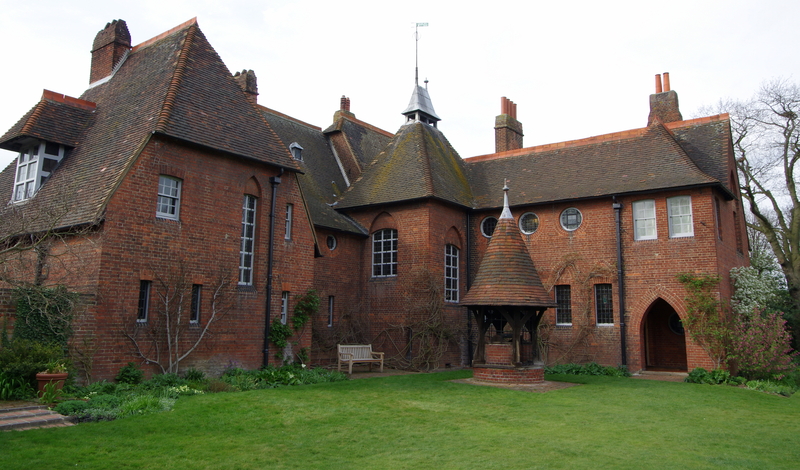 Morris had all his pre-Raphaelite brothers take a hand in the decoration of Red House. Architect Philip Webb designed the house to Morris’ specifications. A lover of medieval art and literature, Morris wanted his new home to have a 13th century look with turrets, peaked roofs, a minstrels’ gallery, a well with a conical roof and stained glass windows. It was one of the first private homes of the era built out of visible red brick — the standard in this period was for brick houses to be stuccoed over — and the interior was decorated by Morris and his friends. Near about the same time, i.e., the latter part of 1860, in a letter to Bell Scott, Rossetti writes to say that his wife has “gone for a few days to stay with the Morrises at their Red House at Upton, and I am to join her there to-morrow, but shall probably return before her, as I am full of things to do, and could not go there at all, but that I have a panel to paint there.” The work was in oils, and it is said that one week sufficed for its execution. The subject of one of Rossetti’s compositions for the Red House was the Garden of Eden. The Garden of Eden, you say, Vallance? Why, we just found one of those behind a wardrobe! Adam and Eve could very well have been painted by Rossetti. 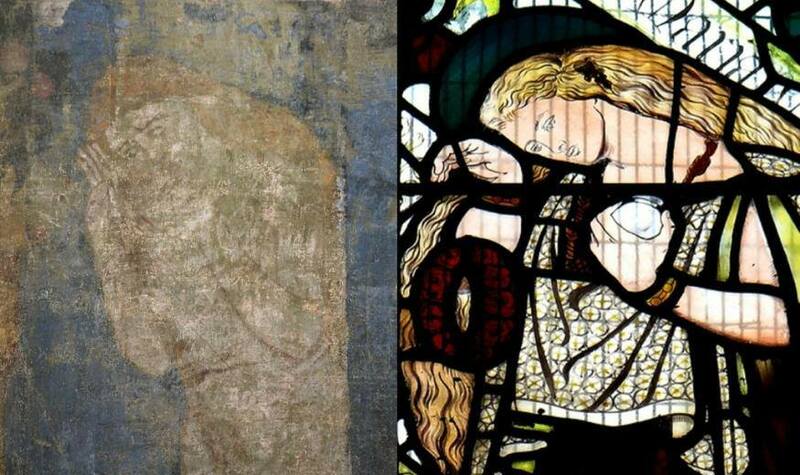 Eve’s posture — her curved neck, long blond hair, one hand held up to her forehead, the other holding an orb — is the spitting image of the Mary Magdalene in a stained glass window in Bradford Cathedral Rossetti made in 1864. Other contenders for the hands behind this mural are Ford Madox Brown for Noah, Elizabeth Siddal for Rachel and Morris for Jacob. Morris probably designed the overall painting. 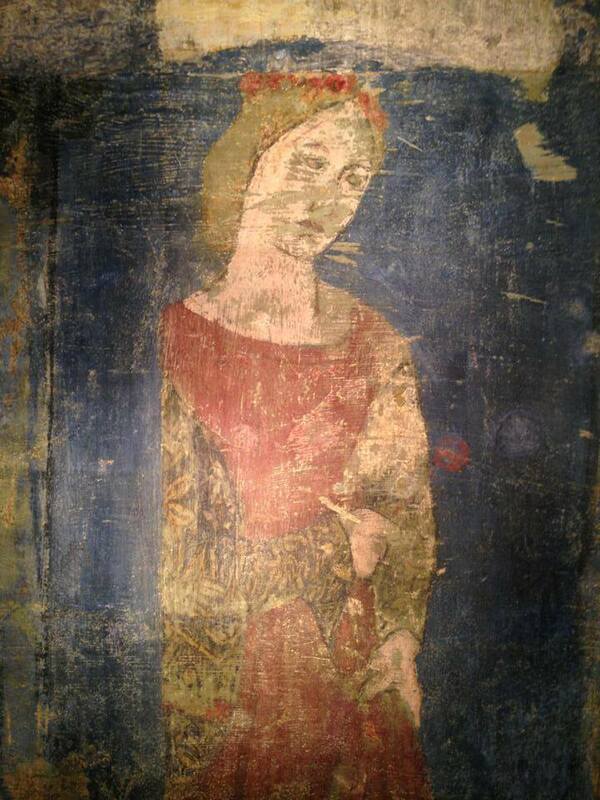 This mural isn’t the only discovery made at Red House since the National Trust’s began to return the house as much as possible to its original condition. Basically everything white is hiding a Pre-Raphaelite treasure behind it, because Morris et al went hogwild in that house. Even elements that were still in view turned out to have parts hidden by later paneling, papering and furniture. 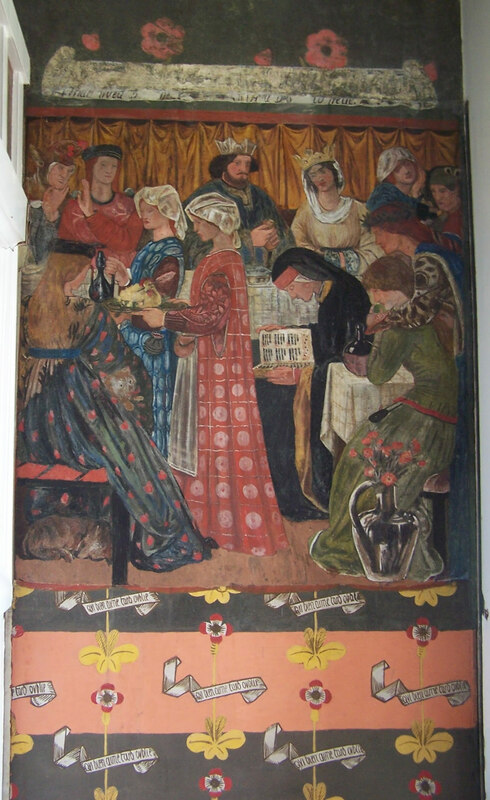 For instance, the Wedding Feast, a mural by Edward Burne-Jones depicting a scene from the 15th century romance Sir Degrevant, depicts William Morris and his new wife Jane as Sir Degrevaunt and his bride Melydor. Conservation healed its massive flaking problem and revealed there was a whole lower section underneath the scene with a pattern of flowers and bandeaux with the motto “Qui bien aime tard oublie” (“he who loves well forgets late”). 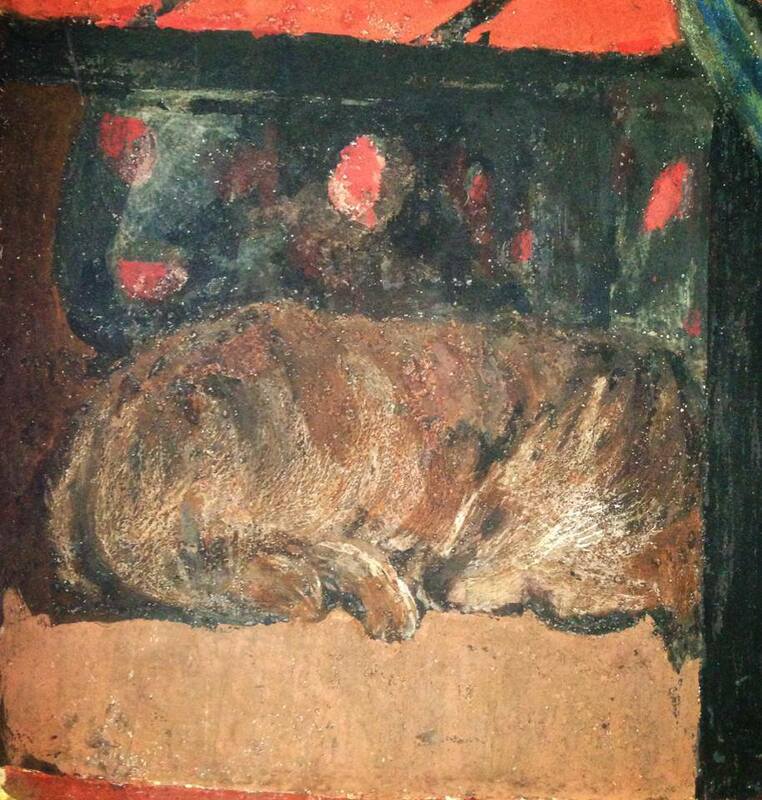 Most awesomely of all, it revealed that what people had thought was a dog curled under a chair in the feast scene is actually a freaking wombat. Yeah. These guys were way into wombats. Edward Burne-Jones is known to have painted several wombats in his career, and Dante Gabriel Rossetti had one as a pet for a while until it died after eating a box of his cigars. Watch these videos from the National Trust’s YouTube channel to get a quick tour of the newly revealed mural and some of the other wall paintings from Red House. It’s a blog. About history. The History Blog © 2019 All Rights Reserved.